Are you looking for frac storage tanks for oilfield operations and fracking applications where fast setup times and an economical product usage are the key? Our portable frac storage tanks offer minimized footprint and available capacity maximization. These tanks are ideal for your fracking project! 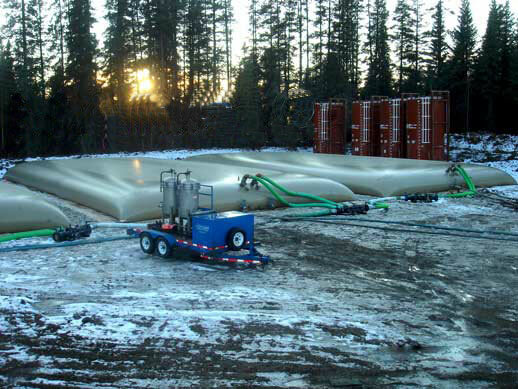 The flexible frac tank is a product commonly used as an alternative to the steel fracking unit. By comparison, a collapsible tank can offer higher storage capacities, flexible construction, and decreased shipping and transportation costs. 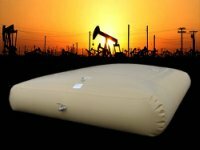 Flexible hydraulic fracturing tanks typically feature a heavy-duty urethane material that can offer high resistance and outdoor use. Frac Storage Tanks can be customized to suit your specific needs. Reduced tank requirements: for example, a 150,000 gal portable frac tank holds about 3,750 US oil barrels which is equivelant to approximately 6 conventional steel frac tanks. Collapsible storage tanks are an extremely flexible product that be constructed to adapt to multiple locations, site requirements, and storage products. They have been used in various aspects of the oil, gas and mining industry including large capacity water storage, fuel storage, and process liquid storage.